Ongoing Operations Credit Union workspace is 100% dedicated to your organization. During installation, all of the setup work is completed and the workspace is put into maintenance mode. This preparation and dedication to a single organization enables employees to begin working within minutes of arriving at the Disaster Recovery Center. What Are The Likely Outcomes? Within 15 minutes of arriving, you can be answering member calls. Cheaper and easier than building your own second site. 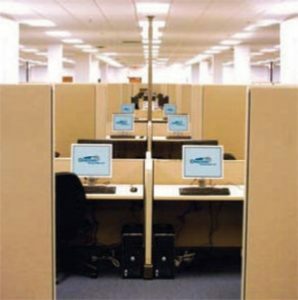 Dedicated to the Credit Union and not included in the pool of basic turn-key space cubicles. What Are The Likely Outcomes? Within 24-48 hours you can be answering member calls. Cheaper than guaranteed space. Contact us at info@ongoingoperations.com today to learn more about our workspace solutions and which option is right for your organization.